Initially his reporting brief from China was not environment-focused. Like many others, he believed the solution to environmental pollution and climate change could be found in smart ideas, strong actions, increased investment and new technology: but he changed his mind after the “biggest news story” of his career. It was the last large-scale search for Baiji, a freshwater dolphin found only in the Yangtze River. Scientists from all over the world, equipped with the most advanced equipment, made careful searches of the middle and lower reaches of the Yangtze, but not a single one was spotted. The next year, the species was declared functionally extinct. Watts was the accompanying reporter in the expedition, and witnessed the atmosphere on the ship change from optimistic and expectant to depressed and angry. He was no longer convinced by reassurances that humanity would eventually get it right. Sometimes it may be too late to remedy the damage caused by the “get rich first, clean up later” model. How could we assume we are becoming more civilized when a 25-million-year-old species, an animal once worshipped, had been wiped out by neglect, greed and human filth? Watts subsequently focused on environmental issues and became Asia environment correspondent for the Guardian in 2008. 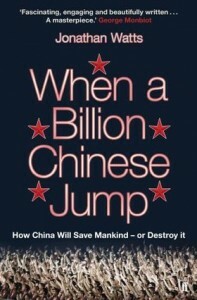 When a Billion Chinese Jump brings together selected reports and investigations from 2003 to 2010 and reports made specifically for this particular book. His eco-travelogue starts in Zhongdian (now renamed Shangri-la) in Southwest Yunnan Province and ends in the north of Inner Mongolia in Xanadu, the summer capital of Kublai Khan’s Yuan Dynasty. His tracks take in export factory zones in eastern and southern China, metropolitan Shanghai, the biodiversity-endangered southwest of China and the polluted industrial cities of the northwest. Watts serves up worrying illustrations of environmental pollution and climate change, documenting conversations with local residents, officials, environmentalists and scientific workers. Throughout the book, he ponders the dilemma that China and the whole world is facing: It is the right of Chinese to pursue a better life, but adopting a Western standard of living in a country of 1.3 billion people will consume huge resources and produce prodigious waste. Can the planet take it? The author warns time and again that we cannot count solely on scientific development to improve the environment, nor have blind faith in its ability to manage nature. Recent years have produced many wake-up calls, alerting Chinese society to the fragility of its environment, the rarity of natural resources, and the fact that China’s economy could soon, and in some places already has, hit the “environmental wall” – the point where economic development reaches the limits of what the environment can sustain, and growth begins to hobble. But the Chinese have “jumped” onto the consumerism train, and people in India, Brazil and Africa are looking to jump aboard too. Jonathan Watts, a self-confessed “born worrier,” just hopes China can find a way to balance a robust economy and healthy environment in the 21st century. What’s up, everything is going sound here and ofcourse every one is sharing information, that’s really excellent, keep up writing. It is actually a greast and useful piece of information. I’msatisfied that you shared this useful information with us. Hi – I came across your website waterink.net and I wanted to see if you have 3-5 minutes to see if I can reduce your payment processing fees? We have some awesome technology in place to help you earn more money. Please feel free to call or email me at 833.326.6729 opt.1 or edwin@ultimatemerchantproviders.com. Please feel free to check out our website at http://www.ultimatemerchantproviders.com Thanks for your time! Excellent goods from you, man. I have take note your stuff previous to and you’re just too fantastic. you continue to care for to keep it wise. I cant wait to read much more from you. of this website, this web site is really remarkable. this piece of writing, in my view its in fact awesome designed for me. This piece of writing gives clear idea for the new viewers of blogging, that in fact how to do blogging and site-building. I am actually thankful to the owner of this site who has shared this great paragraph at at this time. before…? What is your opinion? website conations actually good funny material too. i am as well delighted to share my knowledge here with friends. you make running a blog look easy. The total look of your site is excellent, let alone the content material!